Close to the beach, Big Buddha, restaurants, etc. Villa See at Skye Beach Villas is found close to the pristine, white sandy shores of Plai Laem beach, Koh Samui. Many popular sights on the island such as Big Buddha and Fisherman’s Village are found close to the villa. The two-bedroom villa can be rented out as an eight-bedroom alongside the neighbouring three villas – Villa Saam, Villa Neung, and Villa Song – also part of the estate. 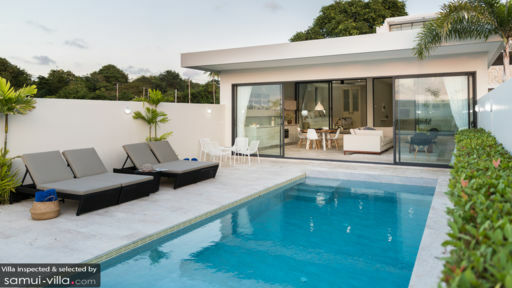 A perfect getaway with loved ones, the villa is designed in a contemporary fashion with subtle colours, modern comforts on point, and plenty of fresh air and sunset views. 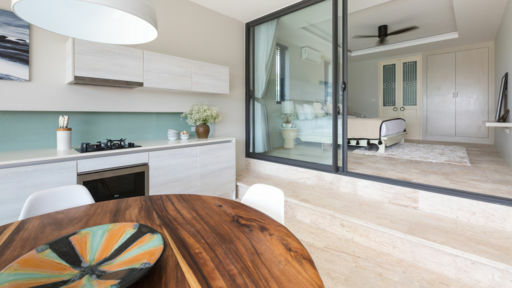 The two bedrooms at Villa See are found through the living room to offer a more private and quiet corner of the villa where you can rest, unwind, and spend time without a worry in the world. Both bedrooms are furnished with king beds and are air-conditioned for a cool and calm ambiance. The décor is elegant and chic with shades of white dominating the space. The bedrooms are a haven for when you want to call it a night. You have ensuite bathrooms with showers, vanities, toiletries, and modern facilities for ease and convenience. The villa outdoors is dominated by the lap pool which is a welcome sight in the morning as you can jump right in and feel utterly refreshed. There is even an outdoor shower for rinsing off before and after a swim. While you relax and stretch out on the sun chairs, the sun will warm you up immediately. The pool deck also houses a four-seater dining table so guests can languidly spend time outdoors in absolute comfort. After a long day of beachside fun, retreating to the comforts of your living room would be utterly comforting and relaxing. The soothing interiors, subtle colours, and serene vibe lends itself to an experience that is one of a kind. The plush couch stands facing the flat-screen TV that is a Smart TV with satellite channels. The marble floors are graced with a soft carpet in a complimentary shade while the black armchairs comment on the monochromatic aesthetic. The room is air-conditioned to keep it cool during hotter hours. There is an indoor dining area for times when you wish to relish a hot meal while gazing out at the sun-kissed skies. The four-seater table is round and wooden that adds character to the interiors. Just beside the dining area stands the kitchen that is modern and fully-equipped to serve all your needs. If you need to prepare a full feast or simply some instant noodles in the middle of the night, the kitchen will deliver. 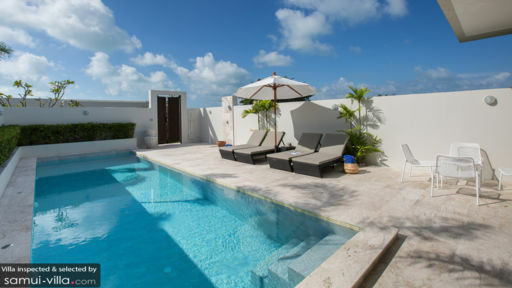 The management at Villa See and Skye Beach Villas comes highly trained and their professionalism is commendable. Housekeeping, maintenance of the pool, and security are looked after so guests can relax without a worry. The villa has a private chef who is happy to prepare delectable meals for guests upon request. For other amenities such as transportation, the management can make necessary arrangements. Villa See in Koh Samui is found at the tip of Plai Laem beach which is mere minutes away from many amazing sights and sounds on the island. The historical sights of Big Buddha and Fisherman’s Village are both close by. An amazing restaurant you can try out is Dining on the Rocks which is a beachside spot with outdoor seating and a chill vibe. Beach bars like Q Bar, Green Mango Club, etc. are excellent for drinks and dancing.